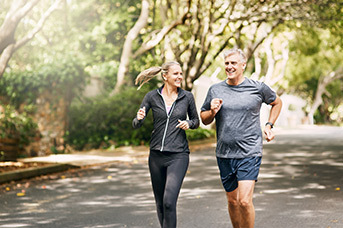 The Live Like Your Life Depends On It program provides information to thousands of Missourians across the state about the importance of healthy lifestyle choices. Taking control of your health by making smart choices will help you live a longer and more productive life. Smoking is a risk factor for heart disease, stroke and lung cancer and is a major health concern in Missouri, where nearly one in four adults smoke. The state has the fourth highest smoking rate in the United States. The Missouri Tobacco Quitline can help smokers quit by providing information and telephone-based counseling conducted by trained tobacco cessation specialists. The Quitline number is 1-800-QUIT-NOW (1-800-784-8669). Preventing youth tobacco use is also vital to reducing Missouri’s smoking rate. Eating a balanced diet and being physically active are two of the most important things you can do to be and stay healthy at any age. They also help prevent obesity, a risk factor for many lasting health conditions, including high blood pressure, heart disease, diabetes, arthritis and some types of cancer. Choose My Plate and the U.S. Dietary Guidelines for Americans offer advice for most Americans on what and how much to eat to nourish the body. Pregnancy and infancy are critical periods of development with unique nutrition needs. People of all shapes and sizes and abilities can benefit from moving more. Some physical activity is better than none and the more you do the more benefits you gain. The U.S. Physical Activity Guidelines give guidance for most Americans on the types and amounts of physical activity needed to see health benefits. Getting the recommended amount of physical activity can add years to your life, make your feel better and improve your quality of life. A health care provider can recommend the screenings you need to protect your health. Getting recommended screenings can help prevent a number of serious diseases or detect them early when they can be more easily treated and cured. Screenings for high blood pressure, cholesterol and blood sugar levels can warn you about the possibility of developing heart disease, stroke and diabetes so you can make lifestyle changes to lower your risk. The Show Me Healthy Women program offers free screenings for breast and cervical cancer to women who meet age and income guidelines. Colorectal cancer screening can detect polyps, which can be removed before they become cancerous. Screening can also discover colorectal cancer early when it is highly curable.